According to Bloomberg and “two people familiar with the matter” anyway. Read more by Hans Nichols at Bloomberg. 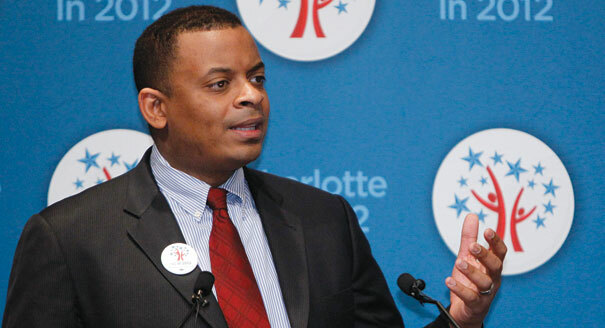 President Barack Obama is considering Charlotte, North Carolina, Mayor Anthony Foxx for secretary of transportation, according to two people familiar with the matter. Foxx, 41, has been a proponent of street car and light-rail projects as mayor of the city, where the Democratic National Convention was held last year. He was first elected in 2009 and re-elected in 2011. Obama also is considering Deborah Hersman, the head of the National Transportation Safety Board, for the position, according to one of the people, both of whom asked for anonymity because the deliberations haven’t been made public. The president is considering candidates from within the transportation department as well. The current transportation secretary, Ray LaHood, announced in January that he would leave the job once a successor is confirmed by the U.S. Senate. Amy Brundage, a White House spokeswoman, declined to comment, as did Alexander Killeffer, Foxx’s press secretary. Via Andrew Dunn (@andrew_dunn) on Twitter.